The other mistake people make is that because often, at Day 10 for example, the leg feels okay, the athlete gambles. He or she runs at 80% instead of 70% to see how the leg feels and the injury reoccurs. Thus you have set yourself back longer. So much is written about gym and rehab programs but little advice is provided about running programs. In fact this is the critical area. 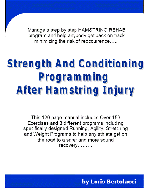 In a “garden variety” 21 day hamstring rehab one would jog at day 5 to 6 then do that for a few days. Then the next sessions at day 8 or 9, might be strides at 50% speed and no faster. This is progressed evenly with 10% increases every second day. Given the short time frame, often it is difficult to go 100% at day 18 as a test, so the program has to be structured to allow the player or athlete to perform fresh and ready on day 21. Running programs are the number one concern in a hamstring treatment program, and you may use repeat 100m strides or flying 20m or flying 30m. It doesn’t matter. What matters is that you progress to a plan carefully and don’t gamble. Remember when you go to the casino you can win, but in the end the casino always wins.